Despite the charge that Revelation 22:16-21 in the Textus Receptus is based on the Vulgate reading, the only translatable differences between the Textus Receptus and extant Greek manuscripts are 2 small words: γὰρ and καὶ. Please read the article at the following link for a prerequisite to understanding how to approach the reconstruction of the Book of Revelation from extant witnesses: Book of Revelation in the Textus Receptus. As for Revelation 22:20, critics raise an issue with the reading “book of life” which appeared to enter the Textus Receptus when Erasmus back-translated the last six verses from the Vulgate. However, Erasmus followed the Byzantine Greek for Revelation 22:20 by inserting “αμην ναι ερχου (Amen. Even so, come)” instead of “amen veni (Amen. Come)” of the Vulgate, so it is not true that Erasmus blindly back-translated the Vulgate. At the very least, Erasmus consulted notes such as the annotations of Laurentius Valla [LINK to scanned image]. Comparisons of the Textus Receptus with other Greek texts at Revelation 22:16-21 demonstrate that the Textus Receptus is sufficiently accurate. 16 ... ὁ ἀστὴρ λαμπρός, καὶ ὀρθρινός 17 καὶ τὸ πνεῦμα καὶ ἡ νύμφη λέγουσιν, ἐλθέ. καὶ ὁ ἀκούων εἰπάτω, ἐλθέ. καὶ ὁ διψῶν, ἐλθέτω. καὶ ὁ θέλων, λαμβανέτω τὸ ὕδωρ ζωῆς δωρεάν 18 συμμαρτυροῦμαι γὰρ παντὶ ἀκούοντι τοὺς λόγους προφητείας βιβλίου τούτου. εἴτις ἐπιτιθῇ πρὸς ταῦτα ἐπιθήσει ὁ θεὸς ἐπ᾽ αὐτὸν τὰς πληγὰς τὰς γεγραμμένας ἐν βιβλίῳ τούτῳ 19 καὶ εἴτις ἀφαιρῇ ἀπὸ τῶν λόγων βίβλου τῆς προφητείας ταύτης. ἀφαιρήσει ὁ θεὸς τὸ μέρος αὐτοῦ ἀπὸ βίβλου ζωῆς, καὶ πόλεως ἁγίας, καὶ τῶν γεγραμμένων ἐν βιβλίῳ τούτῳ 20 λέγει ὁ μαρτυρῶν ταῦτα. ναὶ ἔρχομαι ταχύ, ἀμήν. ναί, ἔρχου κύριε ΙΗΣΟΥ 21 ἡ χάρις τοῦ κυρίου ἡμῶν ΙΗΣΟΥ ΧΡΙΣΤΟΥ μετὰ πάντων ὑμῶν. Ἀμήν. As seen, the differences between the later edition of the Textus Receptus and the Byzantine readings are not that much greater than the differences between Codex Sinaiticus and the Byzantine. The amount of differences is what is to be expected between two texts of Revelation, a book with the highest variant per manuscript number ratio. It is amazing to see how close the Textus Receptus is to the text of Greek manuscripts if Erasmus relied solely on the Vulgate. The closeness would cause one to think that Erasmus did consult other sources besides the Vulgate, as he did with Revelation 22:20 (inserting “αμην ναι ερχου"). Furthermore, Textus Receptus editions published after Erasmus' 1516 edition appear to be based on Greek manuscripts since the revisions bring the Textus Receptus closer to the Byzantine Majority Text. This is a crucial point which demolishes the accusation that the last 6 verses of Revelation in the King James Version were not based on any Greek manuscript. How could the Textus Receptus have gone through the following revisions if the editors did not have access to any Greek manuscript of the passage? The Textus Receptus has been revised to reflect the Byzantine Majority Text where the editors so wished. Therefore the more recent Textus Receptus editions as we have now are not blindly back-translated texts. Where the editors kept Erasmus' readings, the editors may have had Greek manuscripts with those readings. This possibility is demonstrated below. 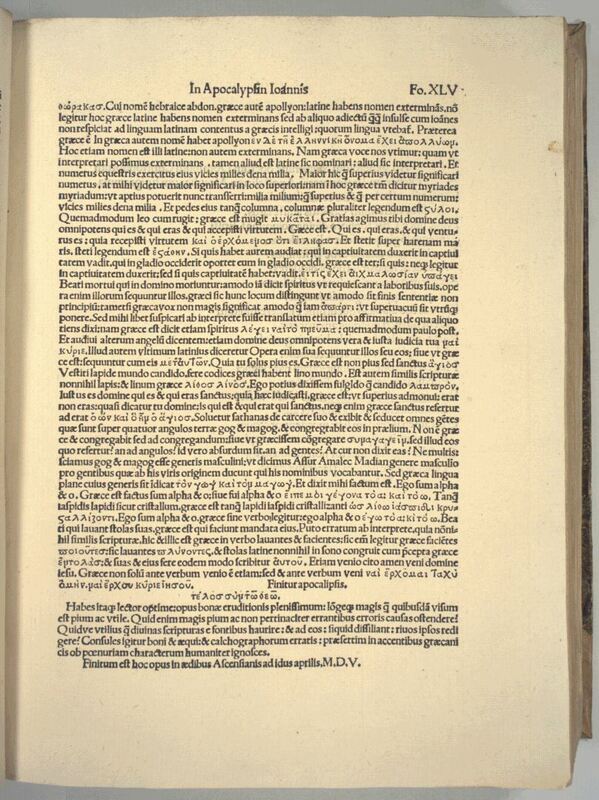 Taking the above into consideration, the following is the Stephanus 1550 Textus Receptus with readings with Greek manuscript support indicated by underlines. We see that only a handful of readings are not supported by any extant Greek manuscript. Both KJV and ESV have "morning"
Both KJV and ESV have "come"
Both KJV and ESV have "take"
λαμβανέτω is supported by 2324 and 1894, though their dates are uncertain. Both KJV and ESV have "the water"
Both KJV and NASB have "I testify"
Both KJV and ESV have "to them"
Both KJV and ASV have "shall add"
Both KJV and ASV have "shall take away"
Even if Erasmus back-translated these verses from the Vulgate for the 1516 edition, subsequent Textus Receptus editions made revisions based on Greek manuscripts and most of the remaining unique Erasmian readings have Greek manuscript support or carry the same sense as Nestle-Aland readings when translated into English. The remaining 2 unsupported words are a conjunction and a particle. These are minor words that are often supplied anyway in an idiomatic translation regardless of manuscript support. The only significant Vulgate-based variants in the last 6 verses of Revelation are "book of life" at verse 19 and "you all" at verse 21. Nonetheless, "you all" is arguably supported by the 12th century minuscule 2050 which has "( )μῶν" (a one letter difference from ὑμῶν). Even considering these two differences, the fact that Erasmus used the Vulgate for these verses for his 1516 edition is used by critics to grossly exaggerate the unreliability of the King James Version. This is even assuming that the Vulgate readings are spurious. It may well be, however, that the Vulgate has preserved these verses better than the extant Greek manuscripts. Samuel P. Tregelles noted that 91 (V. & C.) (1957 in Gregory number) has the Textus Receptus reading of "book of life" (Tregelles, Samuel P., The Greek New Testament, (1857), p. 1017). This is a 15th century supplement to the Codex Vaticanus, which originally did not include Revelation. Herman Hoskier listed 3 minuscules with "book of life": 57 (296) 16th century; 119 (1075) 14th century; and 141 (2049) 16th century (Concerning the Text of the Apocalypse. 2 vols. (London: Bernard Quaritch, Ltd., 1929)). Although 2 of the 4 known Greek witnesses could have been back translated from a printed Textus Receptus, at least 2 of them pre-date the Textus Receptus. Even the NIV, ESV and NASB occasionally follow the Vulgate over the inspired original language text. "Book of life" is found in the Vulgate as early as in Codex Fuldensis of the 6th century. The value of Vulgate readings cannot be dismissed. The Vulgate preserves several passages that are found in the Sinaiticus but were later lost in the majority of Byzantine copies: e.g. “raise the dead” (Matthew 10:8), “the Jews” (John 3:25), “Church of God” (Acts 20:28), Doxology (Romans 16:25-27). Moreover, even the NIV, ESV and NASB prefer several Latin Vulgate readings over readings that are preserved in the originally inspired language. The Old Testament was written in Hebrew. However, the NIV in Genesis 4:8 adds the line, "Let us go out to the field" from the Vulgate even though the line does not exist in the Hebrew. The NIV, ESV and NASB in 1 Chronicles 4:13 add "and Meonothai" from the Vulgate despite its nonexistence in the Hebrew. The NIV, ESV and NASB in 2 Chronicles 15:8 add "Azariah the son of" from the Vulgate despite its nonexistence in the Hebrew. The NIV, ESV and NASB acknowledge that the Vulgate can at times preserve readings that are lost in the originally inspired language text. Please go to the page, Aren't some Textus Receptus readings based on little or no Greek manuscript evidence? for more on this issue. Only Revelation 22:19 explicitly establishes the causality between removing God's word and the remover himself being removed from the book of life. The text of Haymo of Halberstadt (9th century) also has "book of life". The two words in Greek share three of the same consecutive letters. The Beta of βιβλου and the Xi of ξυλου could look very similar with the angled diagonal strokes. If the Iota became assimilated into the second Beta of βιβλου due to poor writing, the amalgamated script could appear to be one letter. The words in Latin share three same letters whereas the words in Greek share three consecutive letters. The chances for confusion appear to be even for Latin and Greek. The Textus Receptus reading is arguably more logical than the other reading. The Textus Receptus reading essentially says that if you take words out of God's book of his prophecy, then God will take you out of his book of life. The passage makes a connection between two "books". The parallelism is weaker when we instead deal with a "tree" and a book. The reason an early Greek scribe may have changed "book" to "tree" may be because the "tree of life" is referred to just a few verses back in verse 14. Verse 14 mentions the "tree of life" and immediately mentions the "city". Verse 19 would appear to be more consistent with verse 14 if it too mentioned "tree of life" and immediately mentioned the "holy city". However, in the previous chapter at Revelation 21:27 a connection is already made between being written in the book of life and having access to the holy city. Revelation 21:27 says, "And there shall in no wise enter into [that great city (see v. 10)] any thing that defileth, neither whatsoever worketh abomination, or maketh a lie: but they which are written in the Lamb's book of life. " (Revelation 21:27). Thus Revelation 21:27 establishes the connection between the book of life and the holy city, and Revelation 22:19 once again makes this connection by saying, "And if any man shall take away from the words of the book of this prophecy, God shall take away his part out of the book of life, and out of the holy city, and from the things which are written in this book." Lastly, though some might be wary of biblical numerology, the book of Revelation does seem to give significance to the number seven. In this context, it might be worth noting that "book of life" appears in Revelation exactly seven times (3:5, 13:8, 17:8, 20:12, 20:15, 21:27, 22:19) if the phrase in Revelation 22:19 is "book of life" rather than "tree of life". The Greek Church did not accept the canonicity of the book of Revelation until 397 AD whereas the Latin Church already accepted the canonicity as early as in 150 AD. There are reasons to believe that Latin witnesses of Revelation could be more accurate than Greek witnesses. The first reason being that the book of Revelation was canonized first by the Latin Church whereas the Greek Church took until 397 AD at the Council of Carthage. While influential Greek fathers in the 4th century such as Chrysostom and Gregory of Nazianzus were still hesitant to canonize Revelation, Christians ministering in the Latin West in the 2nd century - Justin Martyr, Irenaeus, and Tertullian - recognized its canonicity early on. The Muratorian Canon, the oldest known canon that includes Revelation, is a Latin canon. Codex Vaticanus, a Greek codex, does not even have Revelation. Latin commentaries on Revelation by Victorinus and Tyconius existed by the fourth century, but the earliest known Greek commentary on Revelation is by Andreas of Caesarea in the seventh century. Thus the reading "book of life" is the reading of Christians who considered Revelation to be inspired from early times. The reading "tree of life" is the reading of Christians who initially did not consider those words to be inspired. Moreover, the Greek text of Revelation was corrupted early and extensively. Proof of this is given on this KJV Today article on Revelation 16:5 [CLICK HERE]. Revelation 22:19 may well be one of these early corruptions that were never corrected in the Greek speaking Church. Lastly, some claim that the statement, “God shall take away his part out of the book of life” teaches that an elect whose name is written in the book of life can lose his salvation. However, the passage does not teach that. What is taken out is the offender’s “part” (or “portion”) in the book of life. Thus, such a person’s name was never written in the book. The offender begins having a “portion” (an opportunity to be chosen and be written in the book), but upon committing the offence this “portion” is taken out. Hoskier, H.C., Concerning The Text Of The Apocalypse, vol. 2 (1929). Tregelles, Samuel P., The Greek New Testament (1857).